I don’t fry that often. Grease is really annoying to clean and let’s face it- fried food is not the healthiest. Have you tried these guys before? Also known as Jerusalem artichokes, sunchokes are knobby-looking tubers that grow underground. They are rich in vitamins and basically fat free (green light to fry!). 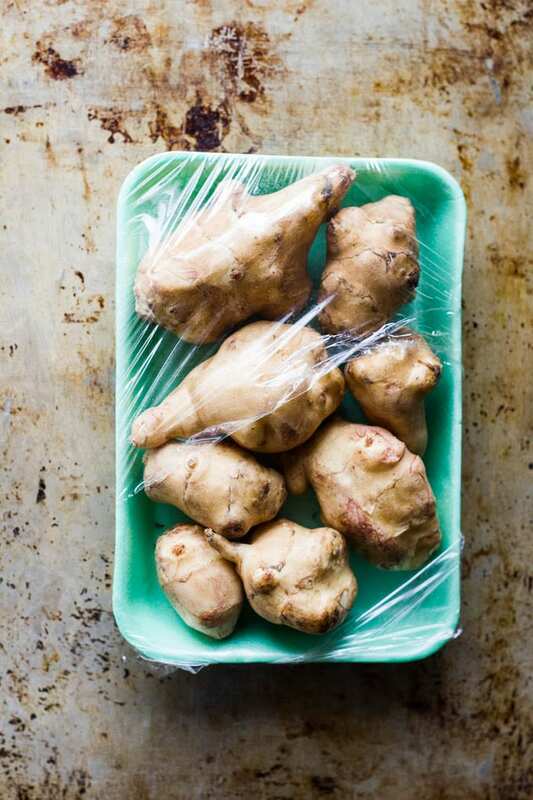 Sunchokes pop up when pomegranates hit the shelves and usually disappear in a flash. The season is short. You’ve probably walked right past them because they’re not the prettiest. Grocery stores never display them like beautiful, red cherries. But keep your eyes peeled; their flavor is unique and worth seeking out. A hidden treasure. They remind me of salted, roasted cashews when fried. I also roast them with herbs and bacon or purée into soup. Fill a medium-sized pot about half way up with vegetable oil. Heat gently. Strip the leaves from a rosemary sprig and roughly chop. Zest one lemon. Add both to a mortar and pestle and season generously with a pinch (or two) of salt. I use Kosher salt. Bash it up to infuse the flavors. You can certainly do this by hand; rub the herbs and zest between your fingertips to release the oils. Mix with salt to combine. There will be plenty leftover and I highly recommend using with steak, fish and potatoes. When you’re ready for the sunchokes, thinly slice as best you can. I use my mandolin. Add one sunchoke slice to the pot; if it sizzles and floats to the top you’re ready to fry. If not, wait a bit longer for the oil to heat up. Now, go change your shirt. Oil stains are a total pain. Then, gently add a handful of sunchokes to the hot oil. Fry, stirring occasionally, until golden brown. Do not overstuff the pot! The bubbles will rise over the top and overflow onto your stove. Big mess and super dangerous. I stupidly did this today but caught it just in time. Transfer the chips to a paper towel lined plate and sprinkle with salt. My first batch came out a little ‘blonde’ but tasted fine. If you want them darker, just keep them in a little longer. Head’s up- you’ll notice that they’re not super crispy at first. Once they cool down they’ll be perfectly crunchy. Oh, and one more thing- sunchokes are not related to artichokes. They belong to the sunflower family! In a medium pot, add the oil to come up about half way up the sides. Adjust the heat to medium-low and heat until 375 F. Use a thermometer if you have one. Grab a large plate and line it with paper towels. 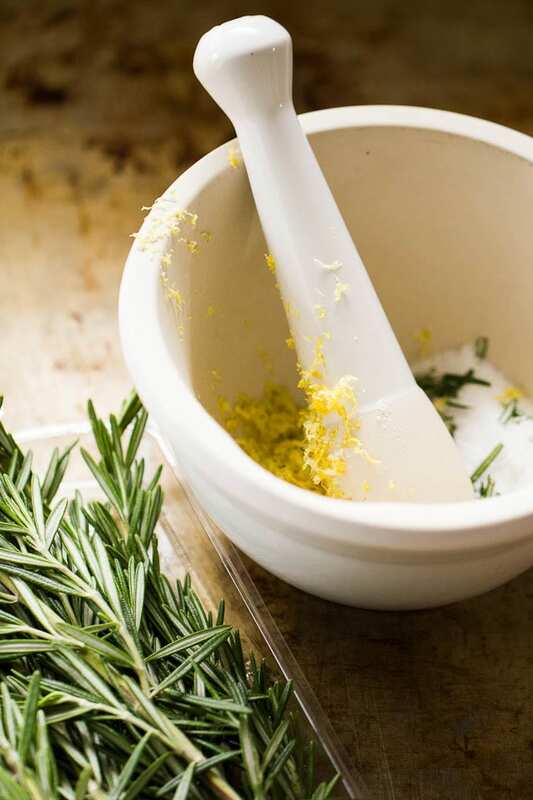 For the salt, add the rosemary and lemon zest to a mortar and pestle. Top with one or two pinches of salt. Bash it up so the flavors can infuse. Alternatively, you can do this by hand; rub the herbs and zest between your fingertips to release the oils. Add the salt and mix well. 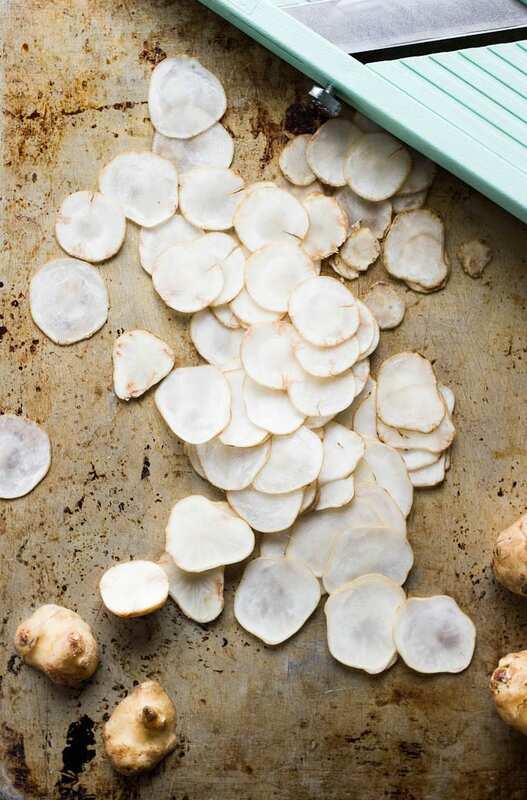 For the sunchokes, slice paper thin. A mandolin is best for this or use a food processor fitted with the slicker attachment. At this point, your oil should be ready. Check the temperature by dropping in one sunchoke slice; if it floats you're ready to fry. If not, wait for it to heat up. Gently add a handful of sunchokes to the hot oil. Fry, stirring occasionally (so they don't stick) until golden. Do not over crowd the pot! The oil bubbles will rise and spill onto your stove. Be careful. Using a slotted spoon, transfer the chips to your lined plate. Sprinkle with the infused salt while hot. Let them sit for a minute to crisp up. Repeat with the remaining sunchokes. Store any extra salt and chips in air-tight containers, respectively. I never fry but you are causing me to rethink that with this recipe – love the lemon-rosemary salt! Looks like those homely looking roots can turn into something quite delicious. Can’t wait to try . Photos are gorgeous! Can these be found year round? We have (f)artichokes in the garden (very ugly and covered in dirt) but I only really use them for soup. Have to try this though over the weekend. Actually, maybe I might just go dig some now. Haha… I’m so glad you tried this Anne! Your photo looked lovely- perfect golden brown. how was the puree? Hope they went down a treat (and worth the stinky kitchen). I LOVE to fry. What can I say? Yes, it is a mess. (So I do it outside.) Yes, it is unhealthful. (No answer for that one.) Yes, what does one do with the oil or grease? (Save old containers and place the oil or grease in them for neat disposal.) There are lots of negatives, but fried food is so darn good, and give me a nice bit of fried dough, and I am in, well dare I say it, hog heaven? 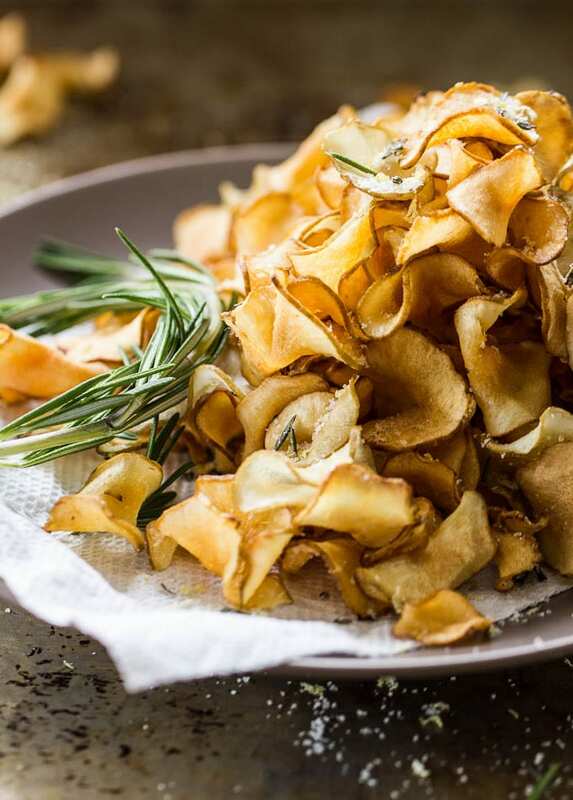 These sunchoke chips are such a good idea. I would like a large bowl of gthem with plenty of your lovely rosemary salt, if you please. Ah! We save grease in empty coffee containers. The whole family does it this way. I should take your advice and fry outside next time (it’s just freezing cold here!). I have an amazing electric skillet that was my grandmother’s and it’s my preferred method for chicken cutlets. You can smell dinner wafting throughout the neighborhood! Genius!! I’ve always tried to figure out how to make sunchokes appealing! This looks so good! I admit. I’m one of those who, given the choice, will walk on by sunchokes. I’ve seen them as an option in my CSA share. I’ve never sought out what to do with them… and I guess, well, they just haven’t grabbed my attention. No more. And I think you’ve convinced me to fry, after changing my shirt! Love your photography, Emilie. Always an inspiration! Thank you for sharing! Hope your weekend is lovely. I don’t blame you at all! And it’s not like there’s a plethora of sunchoke recipes out there to float around in your subconscious. You just don’t hear about them. Plus, they look like ginger- easy to confuse! I have a feeling you will like these guys. 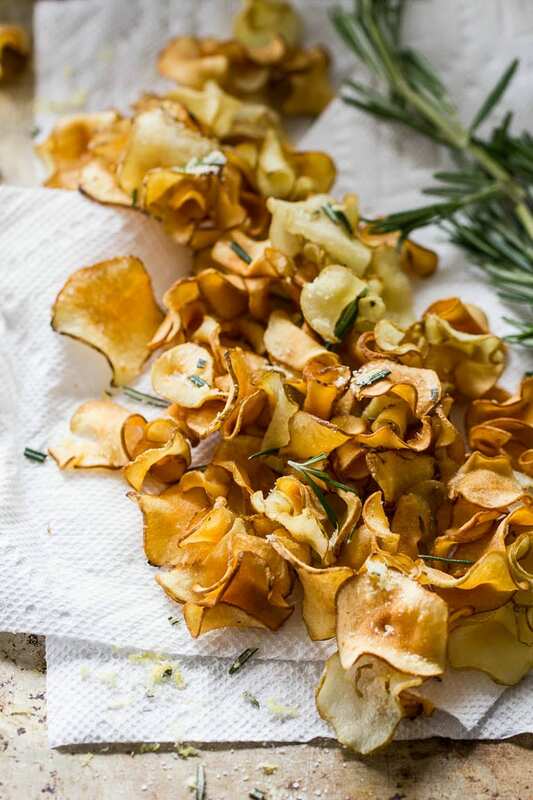 Even if you don’t want to fry them, they are excellent roasted (peel first) with herbs and an infused salt. Or make a bit pot of root vegetable soup. They’re flavor is mild, nutty and sweet. A true gem! Wow. This looks really interesting! 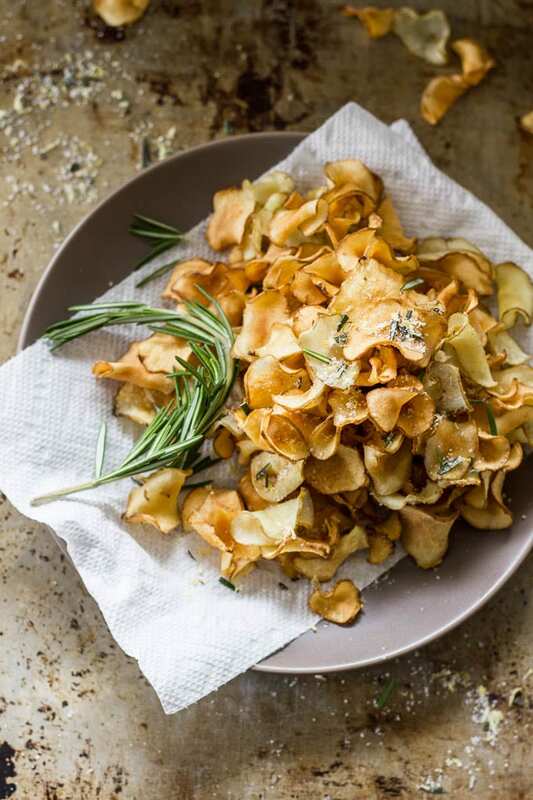 I don’t think I’ve tried sunchokes before but boy am I itching to get my hands on them stat to make these chips. Thanks Jennifer! Sunchokes are really something special. They’re not the prettiest looking things, but they sure are tasty! Even if you don’t fry them, they can easily be roasted. They hold up in the fridge for quite a while too if you don’t get around to making them. I hope you’re able to find some! I don’t fry often, but when the urge strikes me (hello shrimp croquettes or apple fritters!) I just have to. Hate the smell and mess afterwards, but the crispy sensation is worth it. 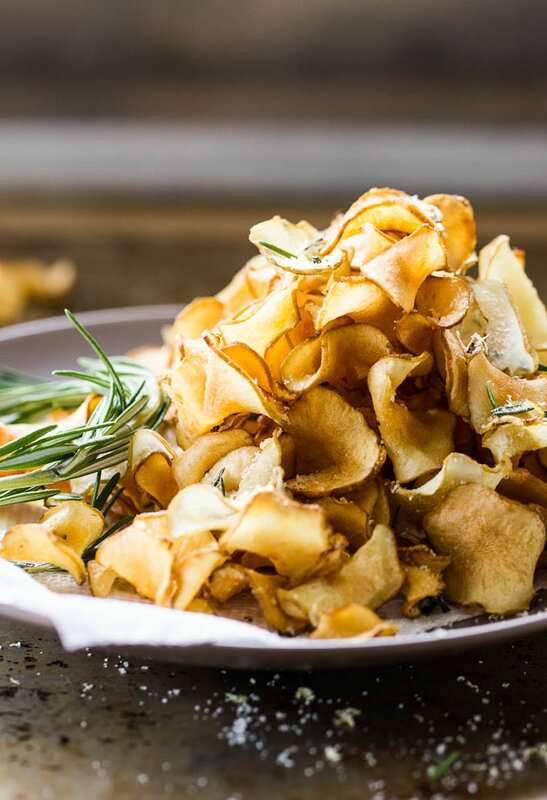 These sunchoke chips seem like a great reason to fry again very soon. I love the addition of lemon-rosemary salt as well! Oh yum- shrimp croquettes! I haven’t had that in a while and it sounds SO good. The smell and mess is a real pain, but frying veggies is way less offensive than meat or seafood. We made steak (pan-fried) last night and the house still stinks this morning. Total pet peeve. Ah well, once in a while surely doesn’t hurt!